In 2007, in a seminar room in Jerusalem, a day-long session was devoted to Israeli regional strategic perspectives. I was among the participants together with several other scholars, a former Israeli interior minister, a future Israeli defense minister, and two future Israeli ambassadors to the U.S. At a certain point, the talk turned to various scenarios for the regional future and the opportunities or dangers each of these entailed for Israel. When the possible breakup and partition of Arab states like Iraq or Syria was raised, the near-unanimous response was that this was simply too fantastic a scenario to contemplate. Now we live that scenario. The great Sunni Arab implosion that began with the 2011 “Arab Spring” was unforeseen in its suddenness, violence, and extent. But some, both inside and outside the Arab world, had long suspected that, sooner or later, a day of reckoning would indeed arrive. (Among Westerners, the names of Bernard Lewis and David Pryce-Jones come most readily to mind.) Today, those in the West who acknowledge this great collapse for what it is will be better able to face the emerging realities. But the first and most important step is to recognize that there is no going back. Dov Waxman, Trouble in the Tribe: The American Jewish Conflict over Israel (Princeton: Princeton University Press, 2016) 328 pp., $29.95. What transpired in Boston distressed the American Jewish community. Yet it didn’t come as a total surprise. The controversial nature of AIPAC is well known, and the unique ideological proclivities of younger American Jews are rapidly becoming better known. What went down the next day in Manhattan, nevertheless, did shock the community—or rather the vast majority of it. On April 20, IfNotNow marched into the lobby of the building that houses the Anti-Defamation League (ADL). Around one hundred activists donned shirts reading, “No liberation with occupation,” and belted out songs in Hebrew. This was an arrow straight through the heart, for the ADL is possibly the most cherished institution of “mainstream” American Jewry. Established in 1913 in response to Eastern European pogroms, its slogan is “Imagine a World Without Hate” and its agenda involves advocating not just for a two-state solution of the Israeli-Palestinian conflict, but also for LGBT rights, voting rights, disability rights, immigrants’ rights and women’s reproductive rights. If this wasn’t enough to raise blood pressure, mainstream American Jews are realizing that they’re vanishing and, as a result, a lot that’s precious is being lost. Spend a day at a Reform temple—about 35 percent of Jews subscribe to Reform Judaism, making it the largest Jewish denominational movement in the United States by a wide margin—and you’ll discover that baby boomer parents and, especially, greatest generation grandparents are alarmed. The sound of thousands of light switches switching off in cavernous sanctuaries across the country rings in their ears—and hearing aids. Within several generations, perhaps two or three, it’s possible that very few people in the United States not adhering to some variant of “observant” Judaism will readily self-identify as “Jewish.” Pew found that 30 percent of American Jews have no denominational affiliation while 22 percent have “no religion.” Before 1970, intermarriage was under 20 percent among American Jews of all denominations. Since 2000, it’s been over 72 percent among non-Orthodox American Jews. Additionally, and it almost goes without saying, religious ritual, custom and belief drop precipitously in intermarried households. Even Judaism as a “culture,” which in the Land of the Free today means hardly more than an affinity for bagels, sarcasm and social justice, will soon be more common among non-Jews than Jews, if it isn’t already. From coast to coast, mainstream American Jews reared on a love of Israel and a Judaism of progressive values are despondent and desperately eager to understand what’s happening. Poor Ali Farahat. He needs surgery, but he can’t get out of Gaza. Well, little does Ali Farahat know, people leave Gaza all the time to take advantage of the many wonderful medical facilities the Zionist Entity has to offer. All you really need to do is fill out a little paperwork. Hey, us Israelis do it all the time when we need medical care. And that’s when COGAT Israel, the agency responsible for coordinating civilian issues in the territories, replied to UNRWA’s very disingenuous tweet and accompanying article with 3 simple tweets that not only demolished this lie but turned it into a plea for the public to help Ali’s parents issue the paperwork necessary to facilitate his treatment. Hillary Campaign Slams Top Advisor’s Son For Smearing Elie Wiesel. But They’re Full Of It. On Tuesday, the Clinton campaign on Tuesday ripped the vicious comments made by anti-Israel Jewish journalist Max Blumenthal, the son of Clinton confidant Sidney Blumenthal, regarding the late Elie Wiesel, the Nobel laureate and Holocaust survivor who died on Saturday. Factor in the consistent anti-Israel advice Hillary Clinton receives from friends and advisors. Put all of it together and it becomes patently obvious that the Clinton campaign’s public efforts to distance themselves from Max Blumenthal are a poor fig leaf to cover Hillary Clinton’s own inherent anti-Semitism. Reik had been defending Max Blumenthal, the virulently anti-Israel writer and son of Hillary Clinton adviser Sid Blumenthal, who had tweeted: “Elie Wiesel is dead. He spent his last years inciting hatred, defending apartheid & palling around with fascists.” Earlier this week, Hillary Clinton’s campaign distanced itself from Blumenthal’s statements. Sadly I have to agree with Max Blumenthal. I hope that people on this list do not use this as an excuse to attack my friends and associates, most of whom probably do not agree with me. Why do I post this at all? Because I think it is the truth and so I am compelled to speak out so that we are wary of others who are honored as peacemakers but are not. Unlike most of Trump’s positions, he has actually been consistent on this one. The candidate previously valorized Hussein’s purported counterterror prowess in New Hampshire back in January 2014, then repeated the claim again on Fox News in December 2015. Given its length, the Chilcot report will address many subjects. One that will likely receive minimal attention will be the actual overthrow of Saddam Hussein’s dictatorship, a military success of stunning scope and effectiveness, achieved in just three weeks. By eliminating Saddam’s threat to Middle Eastern peace and security, the 2003 invasion fully justified itself. Leaving him in power would have all but guaranteed further conflict with other Arab states, and a resumed quest for weapons of mass destruction. But rather than considering the alternative history of Saddam still pursuing WMD and threatening Israel and the region’s oil-producing monarchies, we will hear again about “dodgy dossiers” and US/UK intelligence failures regarding Iraq’s WMD capabilities. I will make only two points on intelligence issues. Second, as America’s Silberman-Robb Commission stressed (in March, 2005, no less), the critical error regarding chemical weapons was believing Saddam’s post-1991 declarations of extensive stockpiles. Iraq resisted repeated UN efforts to verify its claim of destroying its chemical weapons, leading everyone, from Hans Blix to Tony Blair to conclude in 2003 the opposite. In fact, Saddam lied about his capabilities and about trashing them. Had he stayed in power, he would today have even larger chemical stockpiles. His “nuclear mujahideen,” the 3,000 scientists and technicians he had retained, would have recreated his nuclear-weapons programme. Jared Kushner, the Jewish son-in-law of Republican presidential candidate Donald Trump, has denied an accusation that he knowingly ignored anti-Semitic symbolism in a recent tweet by his father-in-law. Kushner, the owner of the New York Observer, was responding to an open letter penned by a writer at the paper, accusing him of pandering to white supremacists and of “playing dumb” on an image tweeted out by Trump claiming corruption by his rival Hillary Clinton alongside a six-pointed star reminiscent of a Star of David. Trump later deleted the image, but many considered it to be the latest in a series of messages from his campaign with anti-Semitic undertones. Kushner is heavily involved in Trump’s presidential campaign, as is his wife, Ivanka Trump. In a press statement, Kushner seemed to deny ignoring the anti-Semitic messaging of the controversial tweet, insisting Trump was too tolerant to have ever intended the suspected racist message. “My father-in-law is an incredibly loving and tolerant person who has embraced my family and our Judaism since I began dating my wife. I know that Donald does not subscribe to any racist or anti-Semitic thinking,” the statement said. A British pensioner who boasts ‘I don’t care if you are offended’ has become an unlikely hit on YouTube for his outspoken opinions on controversial issues. Pat Condell, 66, has 275,000 subscribers and has racked up more than 64 million views of his dead-pan monologues on issues including Islam, feminism, the EU and political correctness. But Mr Condell, who was born in Ireland and lives in London, has attracted lots of criticism, from being called an ‘old fart’ to receiving death threats. One of his videos entitled ‘Welcome to Saudi Britain’ was removed by YouTube. However, the video-sharing website said it had taken down the post ‘erroneously’ and it was soon reinstated, a move that was applauded by famous atheist Richard Dawkins. His most-popular video is entitled ‘No Mosque At Ground Zero’ and has over six million views. 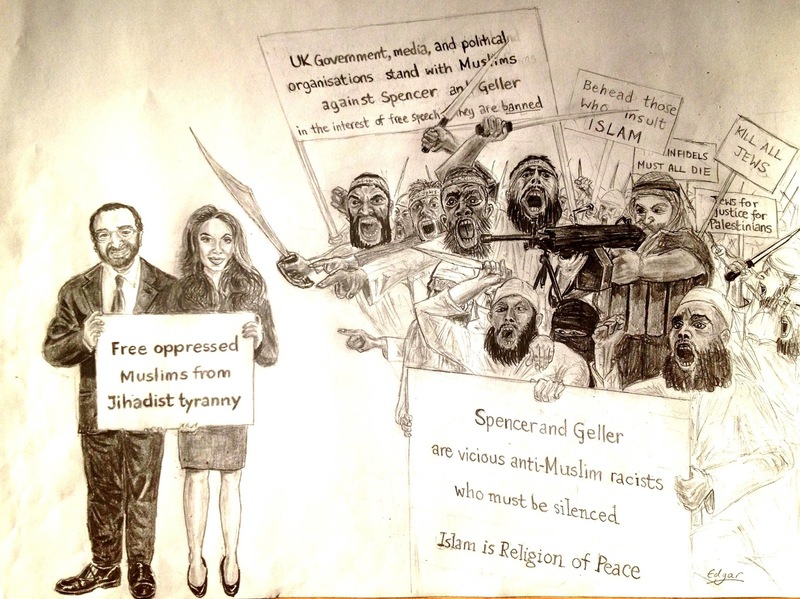 In 2013 I wrote extensively about the banning of Robert Spencer and Pamela Geller from the UK. 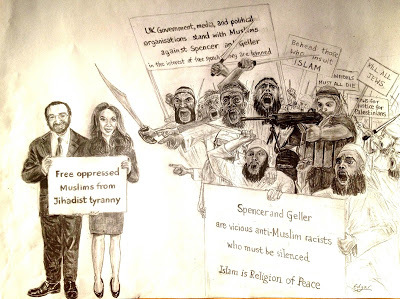 As part of their subsequent lawsuit against the UK Government, Spencer and Geller received documents confirming that their pro-Israel views had been a major factor in the decision to ban them. Revisiting what he defined as uncertainty over French Jewry’s future, Natan Sharansky said Jews are increasingly feeling uncomfortable in France despite the government’s best efforts to protect them. Sharansky, head of the Jewish Agency for Israel, addressed the subject in a letter he sent Tuesday to his organization’s board of governors following its meeting last week in Paris. The event was held in the Paris capital for the first time as a sign of solidarity with French Jews following terrorist and anti-Semitic attacks on that community in the past few years. His letter said that media reports covering the event saying Sharansky believes the community has no future do not accurately capture the issue’s complexity. In the past two years, Israel has seen the arrival of a record 15,000 immigrants from France, which in 2014 for the first time emerged as Israel’s single largest provider of newcomers – a position it retained in 2015. Sharansky has attributed the influx to a convergence of factors, including France’s anti-Semitism problem, its near-stagnant economy and the strong attachment of French Jews to Israel. Nadia Shoufani, a Toronto teacher, was one of the speakers at the annual pro Iranian Islamic Al-Quds Day Rally in Toronto which was held on Saturday, July 2, 2016 in solidarity with the Palestinian people and in support of the call of Iranian regime to oppose Zionism and Israel’s right to exist. A graduate of the American University of Beirut and a former employee at UNRWA, Shoufani is a teacher for Special Education, ESL, Literacy and Science at Dufferin-Peel District School Board. “Ms. Shoufani” is mentioned as a SERT/ESL teacher at St. Catherine of Siena Catholic School in Mississauga. Nadia Shoufani is also affiliated with the Palestine Solidarity Movement and Actions4Palestine and is a director at the Arab Canadian Cultural Association. In contrast, when it comes to fighting BDS, no one organization has been handed (or earned for themselves) that portfolio, which means responsibility for dealing with the problem tends to fall to different individuals and organizations, often working together in coalition. Such coalitions can be extremely effective, even powerful, but they tend to not be nimble given the need to get many groups with differing opinions and agendas on the same page before plans can be agreed upon and then executed. Israel’s domestic foes have even bigger problems forming coalitions, given that they represent the same kind of unstable alliances one finds among Israel’s nation-state enemies. But the guerilla tactics that define BDS, which leverage contemporary distributed/network politics, tend to minimize these disadvantages, at least during any one BDS battle where the enemy is able to put aside differences to achieve a specific, time-bound end (such as winning a divestment vote in a student government, or launching a boycott campaign at a local food coop). Lack of unified command on our side means the response to one of these guerilla-style campaigns can be delayed as pro-Israel individuals and organizations struggle to figure out how to respond and determine who should take point. This delay is compounded further since people on the ground (such as pro-Israel college students or food coop members) are often inexperienced and struggle to determine what to do or whom to turn to, or have to navigate offers of help from people and groups they might know little to nothing about. The recent string of anti-BDS votes within state governments (best described as the success of the BDS movement in getting sanctions enacted – against them!) represents the community’s success in outflanking our opponents by fighting where we are strong and the opposition weak. Even so, it would be nice to couple this momentum with success on other battlefields, especially college campuses where anti-Israel groups (and sentiment) seem to dominate. Two leading Jewish student organizations at the University of Oxford slammed Britain’s Labour Party on Tuesday for failing to keep its promise to address allegations of antisemitism in its recently completed inquiry into the matter. The inquiry into the OULC — led by Labour peer Baroness Janet Royall — did not find evidence of “institutional antisemitism,” but said the club now faces “difficulties” in making Jewish students feel welcome. Royall also issued recommendations for Labour, saying those expelled from the party for antisemitism should not be permanently barred, since “people may change their views.” She called on the party to adopt “a definition of antisemitism” and issue new policies aimed at “swifter action” against claims of antisemitism. Only the executive summary and recommendations of the OULC report were published. After two Palestinian Arab cousins murdered four Israelis and wounded 16 others in a terrorist attack in a Tel Aviv shopping center, Arabs in the West Bank (Judea and Samaria) and the Gaza Strip celebrated with fireworks and by handing out free food. The June 8, 2016 assault itself received considerable—if sometimes flawed—coverage. But, the Palestinian after-terror after party was ignored by media that frequently underreport anti-Jewish incitement. A Lexis-Nexis search of U.S. print news outlets including The Washington Post, The New York Times, USA Today, The Baltimore Sun and The Los Angeles Times, among others, failed to show examples of Palestinian celebrations. Some, such as The Washington Post and The Baltimore Sun, noted an Associated Press report that Hamas—the U.S. designated terror group that rules the Gaza Strip—praised the attack as a “heroic operation.” No additional details were provided and the full scope of Palestinian jubilation went unreported. However, such information was available. Palestinians have carried out dozens of attacks since September, killing 34 Israelis and two visiting Americans. Some 200 Palestinians were killed during the same period. There have been 155 stabbing attacks (including 76 attempted attacks), 96 shootings, 45 vehicular (ramming) attacks and one vehicle (bus) bombing. That is a total of 297 attacks. In the AP’s language, that would be almost 25 dozen. In addition, the AP seems to disconnect Palestinian deaths from these attacks. The news wire service simply says how many Palestinians were killed during the “same period.” But unless it directly states that the vast majority of Palestinians killed have been terrorists neutralized by Israelis defending themselves, it creates the impression that Israel is acting with vastly disproportionate force against innocent Palestinians — something very far from the truth. The Israel Security Agency’s report on terror attacks (Hebrew) during June 2016 shows that throughout the month a total of 103 incidents took place: 71 in Judea & Samaria, 29 in Jerusalem, two inside the ‘green line’ and one incident originating from the Gaza Strip. The agency recorded 86 attacks with petrol bombs. Two shooting attacks, 10 attacks using explosive devices, one vehicular attack and one stabbing attack took place in Judea & Samaria and Jerusalem. One stabbing attack and one shooting attack occurred inside the ‘green line’. Along the border with the Gaza Strip one shooting attack took place. Five Israeli civilians were murdered in Palestinian terror attacks during June. Twenty-one people (mostly civilians) were wounded: fifteen in the shooting attack in Tel Aviv on June 8th, one during the attack in Kiryat Arba on June 30th, two in a stabbing attack in Netanya on June 30th, two in a vehicular attack in Kiryat Arba on June 25th and one soldier was wounded by a petrol bomb in Issawiya on June 29th. The BBC News website covered the shooting attack at Sarona Market in Tel Aviv on June 8th and produced a follow-up article the next day, the third version of which included the names, ages and genders of the four people murdered. An advocacy group for Israel, Stand With Us, pointed out the update on its social media, claiming that “criticism” led to the change. But the graphic does not include reference to several other attacks that have occurred within Israel and the Palestinian territories, including the fatal stabbing of a teenage girl in her bedroom and the murder of a father in front of his wife and kids. CNN offered The Jerusalem Post comment to explain the decision of which attacks to include in the graphic. “We included the attack in Tel Aviv on June 8 that killed four people, because, in line with the other terror attacks listed on the map, we felt rose to the level of a large scale, mass terror attack,” said Allison Gollust, executive vice president and chief marketing officer of CNN Worldwide. Micromedic Technologies Ltd.’s (TASE:MCTC) share price skyrocketed over 75% today, after the company reported positive results in a trial of its prostate cancer diagnosis solution from a urine sample using the CellDetect technology developed by its Zetiq Technologies subsidiary . The trial results showed that when the CellDetect technology was used to diagnose samples from 18 patients and healthy subjects, both groups were accurately diagnosed. The company believes that development of this non-invasive test is likely to improve diagnosis of prostate cancer, avoid unnecessary biopsies, and save the health system hundreds of thousands of costly tests. Micromedic is a biotech company that invests in diagnostic and treatment research. The company’s current market cap (after the today’s rise) is NIS 13.8 million, after losing 60% since the beginning of the year. As a proud Israeli who loves speaking of and for my country, it’s utterly refreshing to arrive in a place where, at the mention of my nationality, I am met with smiles, and welcomed warmly. This is no dream — it’s my experience in Africa. Over the past two and a half years, I have been engaging in business development as the chief of staff of a private holdings and investment group currently in its fourth decade of operations there (and whose managing partner also serves as Rwanda’s honorary consul in Israel). In over 30 months, I have travelled around the continent more times than I can recall, having visited about a dozen countries and having met with public officials and business leaders from about a dozen more. This is the reality I am met with, each and every single time. Indeed it is a stark contrast from my preceding eight-year military service, most of which I served as a spokesman (including that of IDF operations in the West Bank, no less), constantly facing criticism and derision. Africa. A continent that is second only to Asia in geographic size and population. A continent that is diverse, comprised of fifty-four independent, sovereign nations, each with its own history, culture, government, strategy, policy, opportunities and aspirations, challenges and threats. A continent that is hailed as being the most relevant place for business and investment today (with returns hovering around 20%), while also becoming a main battleground in the global war on Islamic terror (the rise of Boko Haram, Al Shabab, and the like). Africa has long been on the map for most of the countries of the world, and yet for Israel, despite the warm receptions, friendly attitude, and endless possibilities, it has, for decades, been all but completely forgotten in terms of strategic policy, whether diplomacy, security, foreign relations, trade, or investment. What are the protocols and values which guide the Israel Defense Forces​ and Israeli medical teams when it comes to war?